There was no recipe given for Rice with Scalded Milk, so I added 1/2 cup of rice (this item was already in my pantry, but costs about .39 cents) to 1 cup milk (cost .25 cents). I brought it to a boil, stirring constantly, then turned down the heat to low. I stirred it and let it cook until it was very thick and starchy, then add about 1/2 cup water and let it simmer for 15 minutes. It was gross and gummy. A tablespoon of sugar greatly improved the taste. The recipe yielded about 2 cups, and I ate half. The recipe for Corned Beef and Cabbage is based on the recipe for Salt Pot-au–Feu, at Ms. Corson’s recommendation. I’ll be making Salt Pot-au–Feu on Thursday, and will get into the recipe in more detail then. There were no instructions in Fifteen Cent Dinners (FCD) to make corned beef from scratch, so I assumed they were buying pre-made, possibly potted, beef that would have been less expensive than making it at home. After comparing prices of modern pre-packaged corned beef, I decided on Budding brand slices, costing a total of .86 cents. I heated 1/2 a piece of bacon (about .15 cents, but I already had this item in my pantry) in a pot, to render some cooking fat and add flavor. I then added 1/2 of a small onion (about .05 cents) and let it cook until soft. I then added the Budding Corned Beef, browned it a little, then poured in enough water to deglaze the pan. I added 1/4 of a white cabbage (.33 cents) and added enough water to cover everything. I put the lid on the pot and let it simmer for 15 minutes. When I took the lid off, the broth was a rich brown color and it smelled promising. 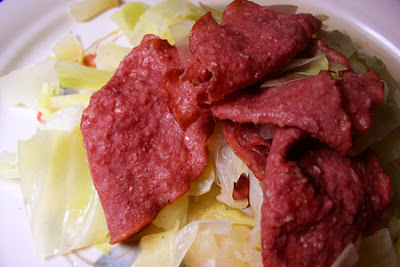 I lifted out the cabbage with a strainer and placed the slices of beef on top. The results: the Budding beef was a bad choice. Although cheaper than its cousin in a can (which costs about $4.00) it was tough, flavourless and inedible. The cabbage was not bad. I’m not a huge fan of boiled cabbage, but perhaps it will grow on me. I added 1/2 cup dry split peas (.40 cents) to the leftover broth from the Corned Beef and Cabbage. I brought it to a boil, then turned down the heat, added a little pepper and salt, and simmered it for about 45 minutes, until nice and tender. I strained the peas and saved the broth for breakfast tomorrow. Nutritious, flavourful, and economical! Right now, I’m so hungry I’m having trouble thinking.